#RedSox have allowed opponents to score 1st in 25 of 45 games this season. 5-19 so far. Buchholz loads the bases with 2 BB and single, 1 out. Buchholz loads the bases with 2 outs for Reyes and Nieves to mound. Shaky outing in danger of blowing up on him. My bad, only one out. Buchholz up to 41 pitches, 2 outs in 2d. Capuano warming up. Buchholz gets Bautista to ground out, end inning, leaves bases loaded. #BlueJays 2-0. Buchholz up to 46 pitches, 22 strikes. 33 pitches, 14 strikes in 2d. Buchholz was fortunate to escape with 1 run there. But he’s down 2-0 and has thrown 47 pitches in 2 innings, only 23 strikes. Pillar CS, Gibbons going out. Pillar 1-out single broke up Lester's string of 12 straight batters retired. LIve I thought Pillar was safe, replay I still think he's safe. Jays lose appeal, but made Lester stand around for a 3 minutes, 30 seconds. Is this new strategy? 8-min rain delay. 3:30-min CS delay. Yeesh. Brock Holt leading off for Red Sox tonight. Napoli, who is on the field now doing some stretching, back for #RedSox after missing two games with an illness. Thought 39 batting orders in 47 games seemed like a lot for #RedSox . But used 126 last season. So much for that theory. Because he was optioned, Drew has to spend 10 days in minors. So could play for #RedSox on June 2 at Cleveland. 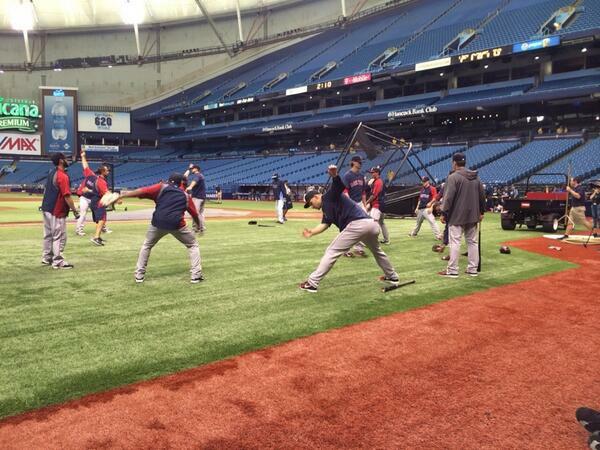 The Rays refuse to play music when the #RedSox take BP. So Buchholz set up a boom box. #RedSox playing some Eric Church, in case you were wondering. Pitching: RHP John Lackey (5-3, 4.01). Pitching: RHP Chris Archer (3-2, 4.59). Red Sox vs. Archer: Pedroia 1-10, Napoli 1-8, Ortiz 3-8, Victorino 2-6, Pierzynski 1-5, Bogaerts 0-1, Bradley 0-1, Carp 1-2, Sizemore 0-1, Gomes 0-1. Rays vs. Lackey: Longoria 11-36, DeJesus 6-27, Escobar 10-21, Joyce 7-22, Loney 7-22, Jennings 4-18, Molina 2-15, Myers 2-6, Rodriguez 2-5, Forsythe 0-4, Hanigan 1-3. Stat of the Day: The Red Sox would have to go 70-46 the rest of the season to win 90 games. The wreckage: The Red Sox are hitting .228/.276/.320 in their seven-game losing streak with only 16 runs scored. They have a 4.95 ERA and 1.63 WHIP in that time. Their starters have a 7.23 ERA in the losing steak, allowing nine home runs in 37.1 innings. Is anything going well? Xander Bogaerts is up to .282/.378/.417 on the season. He is 12 of his last 29 with five extra-base hits. Not even you, Big Papi: David Ortiz is hitless in his last 17 at-bats. He is 3 of his last 26 with no extra-base hits, RBIs or runs. Give us some hope: The Sox are five games out with 116 to play. Other notes: Lackey is 13-7, 4.27 in 22 career starts against the Rays. He beat them on April 29 at Fenway, allowing two runs over eight innings. … Archer faced the Red Sox on May 1 and allowed five runs over 4.2 innings. He walked five and allowed three hits. He has a 6.38 ERA in four starts against the Sox. … The Sox are 10-9 on the road. … Burke Badenhop has gone 17.1 innings without allowing an earned run in his last 14 appearances. Song of the Day: “Desolation Row” by Bob Dylan. Victorino's hamstring strain not as bad as spring training, Farrell said. But still a DL Victorino declined comment. Desperate times. Uehara starts 9th of a 5-5 game. 1-2-3 inning for Uehara. To bonus panels we go. 12 pitches for Koji, so he could return in the 10th. Ortiz on deck to hit for Bradley. Ortiz grounds out, denying the #RedSox a chance to exhume Jonathan Herrera to pinch run. Brock Holt flies out deep to center. His grittiness just a few feet short there. Edward Mujica on for the 10th, not Koji. Buckle up.